‘Manjaro’ 0.8.9 was released a couple of days ago, featuring three official desktop editions -- XFce 4.11 (default choice), Openbox 3.5.2 & KDE 4.12.2. Since I had already reviewed the previous 0.8.7 (‘Ascella’) release, featuring the XFce edition, this time I decided to go with the KDE version. There were a couple of reasons why I decided to try the KDE spin. 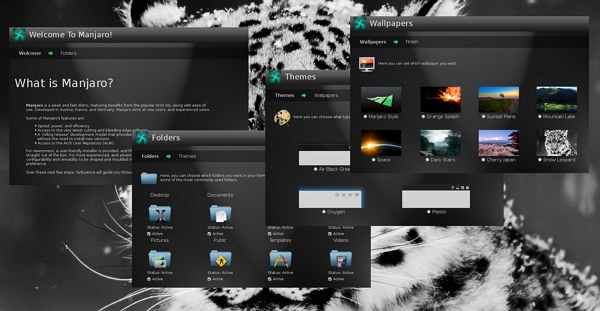 First of all, it looked stunning (thanks to the custom ‘KFaenza’ icon theme and the ‘Air Black Green’ KDE window decorator theme). Secondly, as always, ‘Manjaro’ gives you bleeding edge software versions -- thus an up-to-date KDE desktop & applications. Thirdly, this release comes pre-bundled with a utility called ‘KDE Connect’ (some of you might have heard of it), the purpose of which is to let your KDE computer to be seamlessly integrated with other devices, such as your ‘Android’ device (in fact, it currently supports ‘Android’ only), more on that later. This release also features a brand new tool called ‘Turbulence’ which lets users customize the newly installed system (change themes & wallpaper, enable/disable default listed folders on your ‘Home’, open ‘System Settings’ & the Documentation …). Sure most users would not desire such a tool, but it is definitely handy for new users. … options for LUKS and LVM encryption of partitions, improved UEFI support, improved filesystem detection and handling, and several general bug fixes. This installer has grown a lot since the last release. The downloadable ISO disc image size of the KDE edition is slightly bigger (1.75GB) and includes a lot of software applications plus, being based on KDE, the memory consumption is also bit higher when compared to the lightweight XFce & Openbox editions as well. I downloaded & installed the 64-bit version for this review. 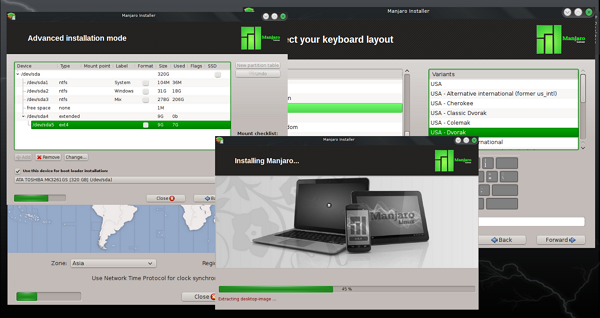 The installer is not based on any other distribution & is completely crafted by the ‘Manjaro’ developers. It is clear, beautiful, simple & most important of all, extremely easy to use. The installation time was slightly longer due to the size of the disc image. Other than that, I did not encounter any issues while using it, unlike the one of the previous release that gave me few troubles. I like the GRUB screen of ‘Manjaro’ 0.8.9. As you can see below, it looks minimal & clear thanks to the short styled menu names. I do not know if it comes with a boot-up logo but I sure did not see one. It was all blank until the KDM executed its login screen. This is not a big issue, but it would have been nice it there was something pretty to look at while booting 😉 . After that I was greeted with a beautiful looking KDE desktop. 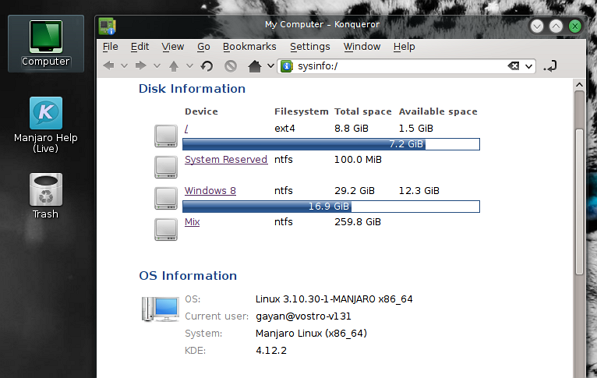 The KDE desktop setup is slightly different in ‘Manjaro’ when compared to others. It comes with ‘Folder Layout’ enabled by default & a simple system monitor widget that lets you see the current CPU, Memory, Network, Temperature, Disk I/O & Usage. Other than the usual ‘Home’ & ‘Trash’ icons, there is a ‘Computer’ icon which once opened presents you with a basic overview of your system (its ‘sysinfo’ viewed through ‘Konqueror’). ‘Homerun Kicker’ is the default start-menu style of the bottom taskbar. 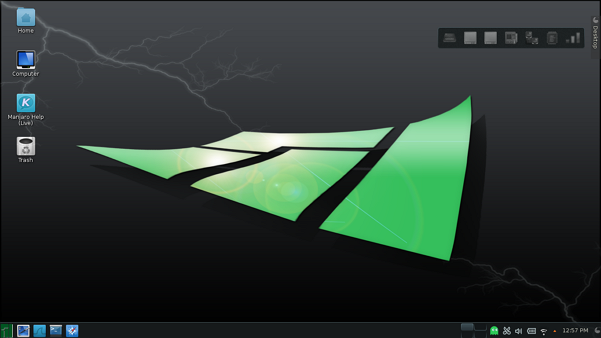 Altogether, it resembles a traditional MS Windows desktop. I also liked the cursor theme, & there are few beautiful looking wallpapers as well. When you login into the desktop for the first time ‘Turbulence’ pops-up and lets you easily change the look-n-fell (icons, wallpapers, window decorations), which folders (‘Pictures’, ‘Public’, ‘Templates’ …) to show in ‘Home’, Documentation & Settings. 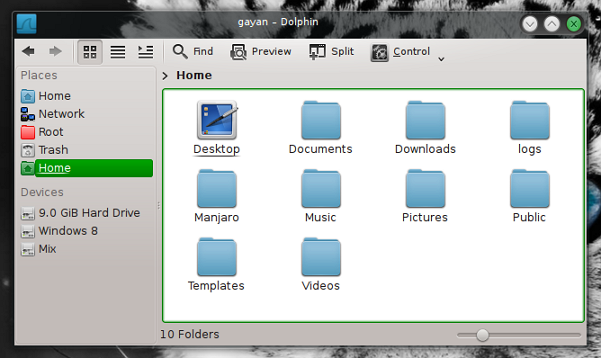 I also loved, despite its massive amount of features, how simple ‘Dolphin’ (file manager) looked. Thus, all in all, it is a beginner friendly, beautiful looking desktop setup. That said, every time I logged into the desktop, even after it gets fully loaded, the desktop gets stuck for about 6-10 more seconds. I have no idea what causes this, but it is quite frustrating. I saw something similar in ‘OpenSuse’ 12.3 KDE & it was because of ‘Nepomuk’ file indexer, but I do not think it is because of that, this time. 1. 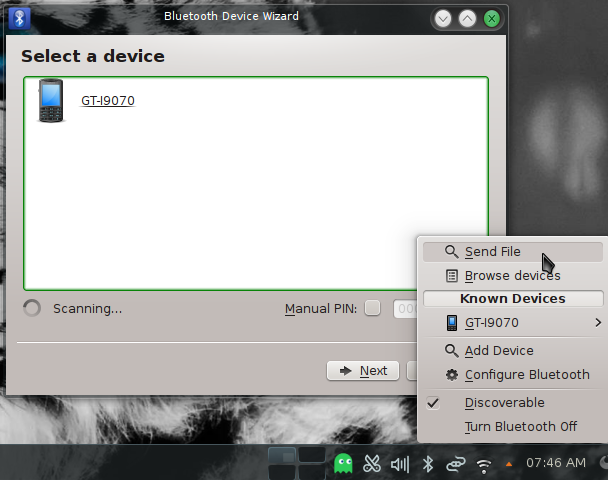 KDE failed to recognize my Bluetooth adapter. This was because the required KDE libraries were not included in the disc image (why ? 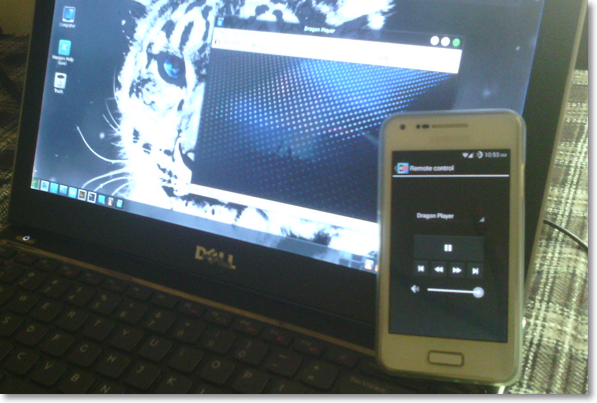 ), but it was not an issue for me since I do not use Bluetooth. If you use it however, then you can use the below command to install them. Once it gets installed, reboot the PC to apply the changes. 2. The brightness gets reset to maximum at each desktop log-in. This however has always been the case for my laptop in other distributions. 3. Whenever I receive ‘low battery’ warnings, then too the brightness gets reset to maximum. This also happens in other KDE distributions, not something unique to ‘Manjaro’ KDE. 4. 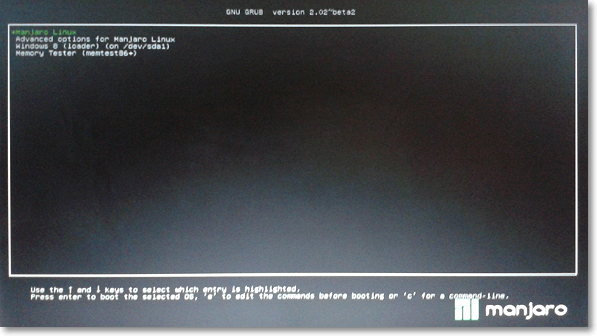 Fingerprint reader was also not recognized but this too is not Manjaro’s fault as it is not yet supported by Linux. Other than those, all of my hardware were recognized correctly and worked just fine (‘Suspending’ included which only takes about 2.5-2.7 seconds). I also guessed in my previous review that sometimes ‘Manjaro’ improperly shuts down my hard disk when turning off, as I could hear a loud ‘clack’ sound, which usually is an indication of improper ‘arm’ park of the disk drive. I am happy say that with this release, I did not encounter such issue. This utility, as briefly mentioned in the beginning, lets you seamlessly integrate your Android phone (you have to install it manually, & it is available in ‘Google Play’) with the KDE desktop by using a Wi-Fi access point. 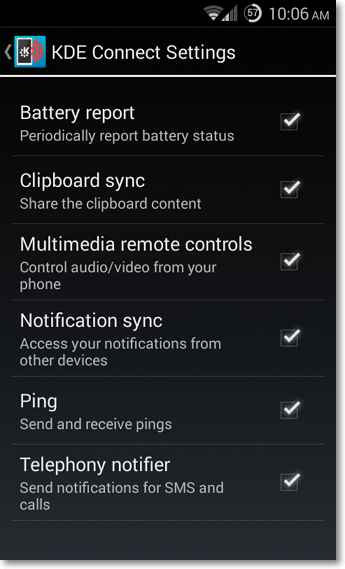 Once configured, this tool can sync clipboard content, send phone notifications (SMS, calls …), integrates the phone’s battery into the KDE battery monitor (it did not work for me), send files to the KDE desktop, and you can also use your phone as a remote control for controlling multimedia players, which is pretty cool 🙂 . There is no GUI front-end for KDE, and everything is configured through the Android client. 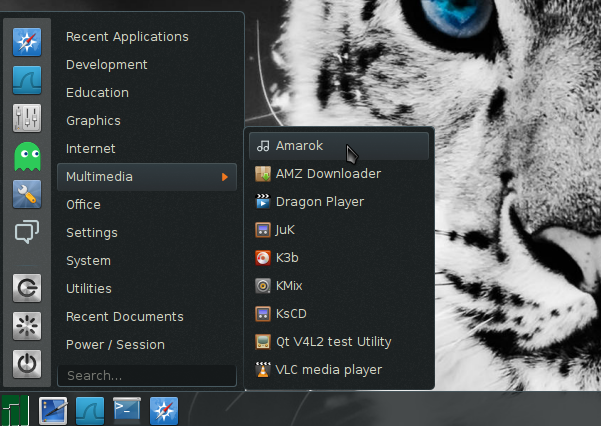 ‘Manjaro’ ships with proprietary multimedia codecs (Adobe flash included) by default and comes with two music managers -- ‘Juk’ 3.11 & ‘Amarok’ 2.8.0, and three multimedia players -- ‘Dragon Player’ 2.0, ‘VLC’ 2.1.3 & ‘MPLayer’ 4.8.2. Other applications include ‘rekonq’ 2.4.2 (very fast WebKit based web browser, I love it), ‘KGet’ 2.12.2, ‘KTorrent’ 4.3.1, ‘Blogilo’ 1.1 (blogger client), ‘Konqueror’ 4.12.2, ‘K3b’ 2.0.2, ‘LibreOffice’ 4.1.5.3, ‘Yakuake’ 2.9.9 (drop-down style terminal emulator), ‘KMail’ 4.12.2, ‘Okular’ 0.18.2, ‘GParted’ 0.18.0, ‘Octopi’ 0.3.2 (very fast & lightweight application manager), ‘DigiKam’ 3.5.0, ‘GIMP’ 2.8.10, ‘Gwenview’ 4.12.2, ‘showFoto’ 4.12.2 and a lot more. I measured these data first (on the newly installed system, without touching anything) so the measurements do not get affected by external/internal factors. And took 5 samples of each test for calculating average values. 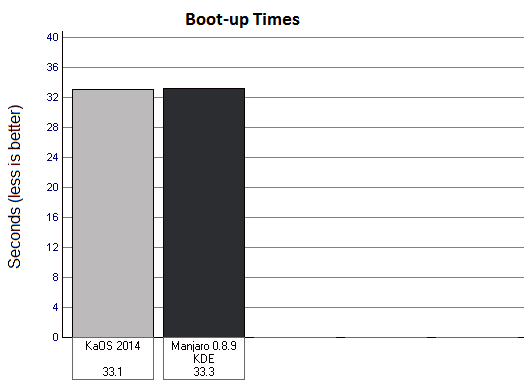 I decided to compare ‘Manjaro’ KDE 4.12.2 with ‘KaOS 2014‘ (another KDE oriented distribution) KDE 4.12.1. As you can see both distributions boot at pretty much the same speed. 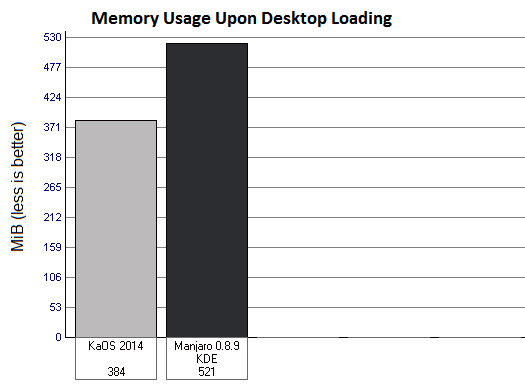 They differ quite heavily when it came to memory usage as ‘Manjaro’ used around 36% more RAM (below). As you can see, KDE 4.12.2 did pretty good while maintaining a low CPU usage consumption at idle, and only the system monitor itself kept using about 1% of the CPU time in frequent intervals (I have seen it in other recent KDE versions). 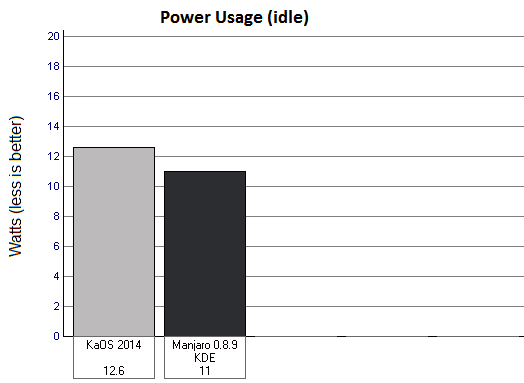 When it came to low power usage at idle ‘Manjaro’ KDE simply rocked!, although the previous release scored a 10.5W reading. This is still very efficient when compared to others (Ubuntu included). One of the reasons why it consumed less power was because it spun-down my SATA HDD somewhat aggressively (within short intervals) and it stayed that way for long durations. In fact, while I was measuring power using ‘powerstat’ which runs for a few minutes while gathering samples, the disk was spun-up only once!. 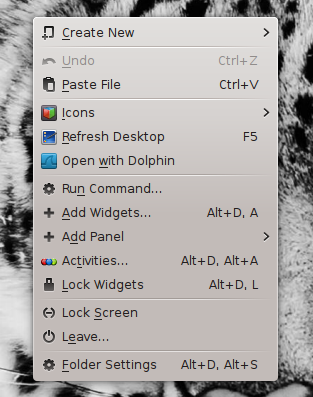 In that regard, KDE 4.12 was fantastic. As I have mentioned many times on previous occasions, KDE has not been that responsive under heavy disk I/O stress, when comparing with other desktops (Gnome3, XFce & Cinnamon). This however, was proven to be wrong by KDE 4.12.1 that came with ‘KaOS 2014’, which just blew my mind with its truly superior level of responsiveness under stress. So I thought perhaps at last KDE has done it, and so I tried to carry out the same test -- trying to load multiple programs simultaneously while copying a large file within the same disk … well, it was horrible. Forget about even trying to navigate the ‘Start-menu’, I could only click the ‘LibreOffice Writer’ and nothing else, because the OS was too busy ‘attending’ to the file copy job. And it was only after it was finished, the previously executed ‘LibreOffice Writer’ was opened. It sucked. Interestingly however, if I tried to open multiple programs simultaneously, without putting the disk under further pressure by copying a large file, then they all opened fast enough and the overall responsiveness was pretty good. 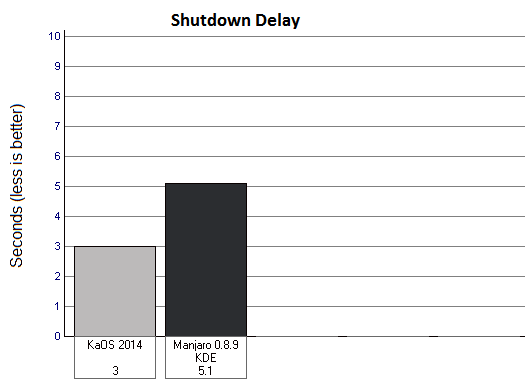 Rarely, ‘Manjaro’ took around 8-10 seconds while shutting down, but most of the time it was fast, although ‘KaOS’ was still about 70% faster. But 5 seconds of delay is more than acceptable. 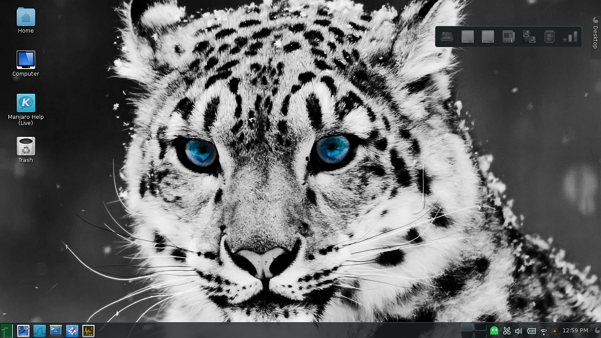 ‘Manjaro’ 0.8.9 KDE is a beautiful desktop. It plays proprietary multimedia content by default, manages power efficiently, comes with lots of applications, & if you have an Android device, then you will love the ‘merging’ of the two platforms. In other words, it is a very beginner friendly distribution. However, it has few issues. First of all, if you use Bluetooth, then you will have to manually install the required tools (it really is not that difficult). Secondly, after fully loading, the desktop gets stuck for a few more seconds. But worst of all, when the disk is under stress, the OS struggles to maintain, at least a reasonable level of responsiveness, although if you do not put it under stress by copying a large file when opening programs, then you can still open programs simultaneously without major lag in performance. So, I will not add a ‘conclusion’, and am only here to remind you that you should consider its ‘pros’ & ‘cons’ carefully, before deciding. If interested, you can get it from here (read the release notes from here). Good luck. Thanks for the review! I wonder if the responsiveness (or lack thereof) under disk load is due to the I/O scheduler used. Could you check the scheduler on your Manjaro and KaOS? My Manjaro 0.8.9 (Cinnamon edition) is using the [deadline] scheduler. I wonder what KaOS uses. You’re welcome!. As for the questions, ‘KaOS 2014’ uses ‘cfq’ and Manjaro 0.8.9 KDE uses ‘deadline’ (which is also what Ubuntu uses these days). From my limited experience, although the disk I/O scheduler has a big influence on the overall responsiveness (take ‘bfq’ for instance), both ‘cfq’ & ‘deadline’ deliver pretty much the same performance (‘deadline’ is marginally better in Ubuntu). That said, when I was reviewing ‘Opensuse 12.2’, even back then KDE had this problem of not being responsive under stress. KDE of ‘Opensuse 12.3’ also had it and back then I tried to isolate the issue by manually installing Gnome3 (which I’ve also known for its superior responsiveness!) 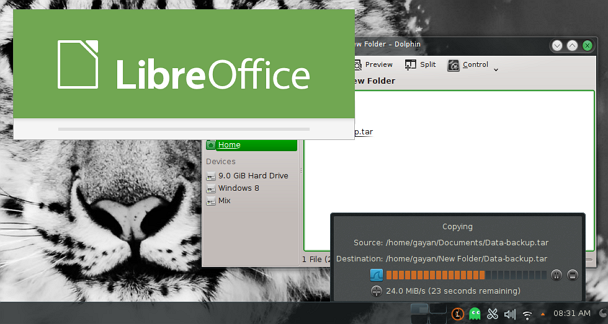 under the KDE version of ‘Opensuse 12.3’ and ran the same test under Gnome3. Unsurprisingly, under the same disk I/O scheduler (‘cfq’, same one ‘KaOS 2014’ uses), Gnome3 rocked the test while KDE sucked and I think it was because of ‘KIO’ API why KDE sucked. I might be wrong here because I’m not that knowledgeable in this area to be honest … but that’s as far as I could go. There appears to be a common reason that all Linux based (desktop) distros suffer performance problems under a heavy load and there’s a solution which has been long applied by, for example, Debian/Ubuntu based users that involves modifying “vm.swappiness” via the “/etc/sysctl.conf” file meaning the point where the OS shifts data going into memory from physical memory to the swap partition. But in Arch based distros things are a little different. The first line tells the system to keep data in physical memory until available memory reaches 20%. The second tells Linux that we want it to prefer inode/dentry cache (filesystems caches) to other caches. Good for desktop OSs. Unfortunately, for Manjaro, which uses “systemd” this file exists somewhere else but there’s a catch. 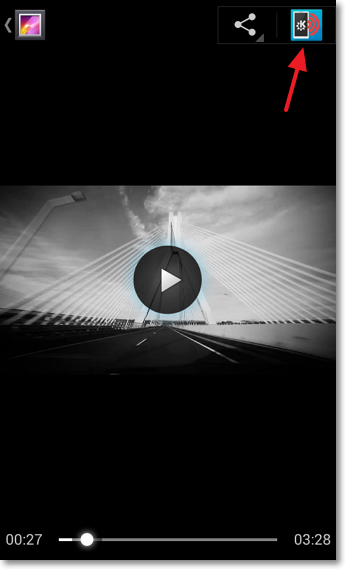 …to the newly created file. Save the file, reboot and try running your load test again. I’d really be interested in the results. For example, I have Manjaro/XFCE 64-bit installed on my older Lenovo R61 (Intel Core2 Duo, 4.0 GB DDR2, all Intel chipsets) and before I made the modifications I mentioned above the system would shift data to the swap partition on the HDD at around 1.2 GB memory used out of 4.0 GB. At that point the laptop slowed to a crawl. Once I did the modification the problem was gone. You probably know this already but I hope it helps anyway. Than you for the input 🙂 . But you see, I don’t have a Swap partition (since I have 4GB of RAM which is more than enough for my needs, though I sometimes create a virtual swap file if needed) thus it eliminates the possibility of ‘page swapping’ being one of the reasons. Even if we forget that, the responsiveness was horrible even when the RAM usage was minimal. For instance, in ‘Manjaro KDE’, after starting the file copy process & clicking on ‘LibreOffice Writer’, I couldn’t even navigate the Start-menu for opening other programs (as you can see, by then most of the RAM should had been freely available). 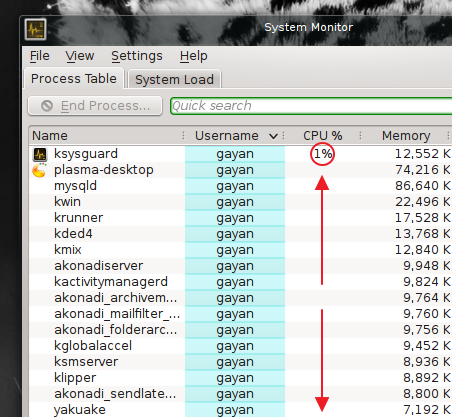 So from my humble opinion, NO, it’s not the excessive RAM usage the problem here. Plus, if the RAM use was too high, then some of the programs should have crashed since there the OS cannot swap their ‘pages’ from RAM to the disk, which didn’t occur. Plus, as I briefly mentioned above (comment), I ran the same test in Gnome3 & KDE in the past, under ‘OpenSUSE 12.3’, & Gnome3 rocked the responsiveness test while KDE sucked, under the same ‘swappiness’ setting (although I don’t know what the ‘swappiness’ value used in that distribution). So again, although ‘page swapping’ is heavily responsible for negatively affecting the responsiveness, I don’t think it’s related to ‘page swapping’ on this occasion. You can go as low as 1 if you want but i like to leave 20% of my physical memory free. No particular reason, just me my choice. how do I install KDE 4.12.2 ?